Egyptians are deeply dissatisfied with the way things are going in their country. And the hopefulness of 2011, when a majority was optimistic about the future of Egypt, has vanished. Additionally, the public continues to say that economic conditions are bad and does not hold high expectations for any improvements in the upcoming year. While Egyptians of all stripes are down on the state of the country and its future, those who have positive attitudes toward presidential candidate Abdel Fattah El-Sisi and favor last year’s military takeover are slightly more optimistic. Nearly three-in-four Egyptians (72%) are dissatisfied with the way things are going in their country, with only around a quarter (24%) saying that they are satisfied. This represents a steep drop in country satisfaction from the levels seen in 2011, just weeks after the overthrow of the Mubarak government. 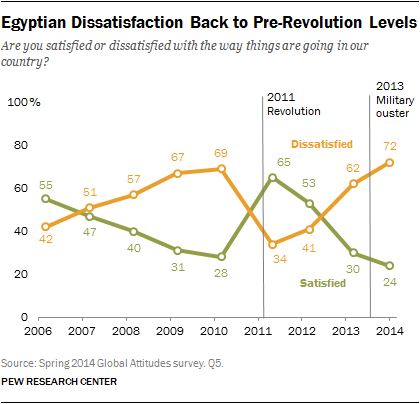 Then, 65% of Egyptians were satisfied with the direction of the country, with only about a third (34%) dissatisfied. In fact, the levels of dissatisfaction seen today mirror the country’s mood in 2010, just months before the 2011 revolution (28% satisfied, 69% dissatisfied). 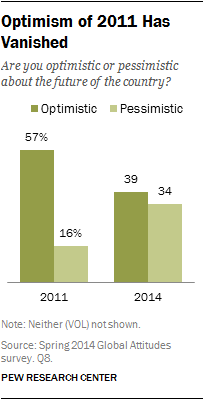 There is also much less optimism today among Egyptians for the future. Currently, only 39% of Egyptians are optimistic for their country’s future, while a similar number (34%) are pessimistic (and 22% volunteered that they are neither). In 2011, a majority (57%) were hopeful about the future of Egypt, with just 16% saying they were gloomy (26% said neither). An overwhelming majority of Egyptians say that current economic conditions in their country are bad (76%), while only 21% say the economy is good. Perceptions of economic conditions in Egypt have been quite poor for some time. In Pew Research polls, only in 2007 did more than half of Egyptians (53%) have a positive view toward the country’s economy, although even then nearly half (46%) thought the economy was in bad shape. When asked about economic conditions over the next 12 months, Egyptians are split in their opinion. Only 31% say that the economy will improve over the coming year, while an equal number say economic conditions will remain the same. About another third of Egyptians say economic conditions will worsen (35%). As with views about the country in general, Egyptian perceptions of future economic conditions were more positive in the aftermath of the 2011 revolution than they are now. Then, a 56%-majority in Egypt said economic conditions would improve over the next 12 months, while only 17% said they would worsen. Views about Egypt’s direction and the state of the economy tend to be somewhat more positive among supporters of Sisi and last year’s military takeover. However, even among these groups ratings are generally negative. For example, 28% of Egyptians who have a favorable view of Sisi are satisfied with the country’s direction, compared with 18% of those with an unfavorable opinion of the former defense minister. And among those who favor the ouster of the Morsi government, 35% say the country is moving in the right direction, while only 8% of those who oppose last year’s ouster agree. The same pattern is generally seen for current and future economic conditions.